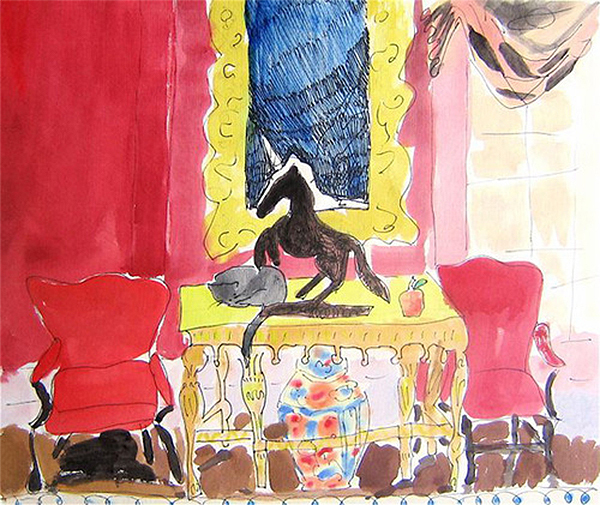 I spotted what looks like a black unicorn in this painting by Bella Foster. Unfortunately there’s no point of reference, such as a title, to give a clue as to whether the painted figurine of a horse is intended to be a unicorn. The painting is a little ambiguous as the horn looks like it could actually be a part of the painting hung behind the figurine rather than being attached to the horse. I like the ambiguity though as it plays into that idea that the unicorn is an imaginary creature – it’s our imagination that is piecing together the parts of the painting in order to create the appearance of a unicorn.